Diversifying the nation’s health professions is essential in order to maintain a vigorous health workforce, able to respond to the needs of all Americans. The inability of the health workforce to keep pace with the changing demographics of the nation is a major cause of the persistent inequities in access to quality health care for ethnic and racial minorities in the U.S. 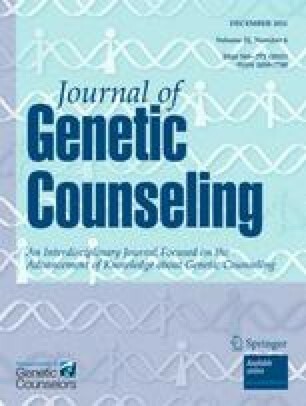 Ethnic and racial minorities have been underrepresented in the genetic counseling profession since its inception, despite vigorous professional initiatives to remedy this situation. Mittman and Downs published a critical review of these initiatives detailing recommendations for change in this journal in 2008. One of their major recommendations was the need to learn from, and join, efforts with other health professions in seeking to increase professional diversity in genetic counseling. This paper reviews new findings on issues impacting health workforce diversity in the nation, presents a case study of a national best practice to diversify the health workforce and illuminates actions that can be taken by the genetic counseling profession. The Sullivan Alliance to Diversify the Health Professions is a culmination of two historic initiatives for addressing the dearth of minority health professionals and is a national catalyst for increasing diversity within the health professions by forging state collaborations among institutions of higher education, health professions schools and other key stakeholders. Agency for Healthcare Research and Quality. (2010). National Healthcare Quality and Disparities Report, 2010. Retrieved 7/24/11, from http://www.ahrq.gov/qual/nhdr10/nhdr10.pdf. American Medical Association. (2009). Total Physicians by Race and Ethnicity - 2008. Retrieved 7/24/11, from http://www.ama-assn.org/ama/pub/about-ama/our-people/member-groups-sections/minority-affairs-consortium/physician-statistics/total-physicians-raceethnicity.page. Higher Education Research Institute. (2010). Degrees od Success: Bachelor’s Degree Completion Rates Among Initial STEM Majors. Retrieved 12/30/10, from http://heri.ucla.edu/nih/HERI_ResearchBrief_OL_2010_STEM.pdf. HRSA. (2010a). Findings from the 2008 National Sample Survey of Registered Nurses. Retrieved 7/24/11, from http://bhpr.hrsa.gov/healthworkforce/rnsurveys/rnsurveyfinal.pdf. HRSA. (2010b). Health workforce studies. Retrieved 7/22/10, from http://bhpr.hrsa.gov/healthworkforce/. U.S. Census Bureau. (2008). An older and more diverse nation by Midcentury. Retrieved 10/22/08, from http://www.census.gov/Press-Release/www/releases/archives/population/012496.html. U.S. Census Bureau. (2010). People quick facts. Retrieved 12/29/10, from http://quickfacts.census.gov/qfd/states/00000.html.